We don’t have some of the instruments mentioned in the Bible (it would surprise everyone to hear a timbrel, or a lyre, for instance) but we do use many instruments in worship. The present organ is a fully pipe instrument, built by the Moeller Company and installed in the 1960s. The 8:45 service uses organ primarily, enriched with strings and brass and percussion on festivals. The Chancel Choir contributes an anthem to the 8:45 service nearly every Sunday, and rehearses on Thursday evenings at 6:30. Like church choirs everywhere, this choir eagerly welcomes new members, of any voice range. No audition is necessary. 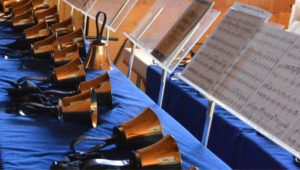 The Bell Choir usually plays one Sunday a month, and rehearses on Thursdays, beginning at 5:30. You should be able to read music well enough to count, but the director patiently helps beginners to improve. That said, ringers at all levels of experience are welcome to appear at rehearsal. At the 11 o’clock service, a Song Leader encourages the participation of all who are present, and is accompanied by piano. This is a service where spontaneity and improvisation are valued, so no one would be surprised to hear drums, or a flute—or maybe that timbrel. All of the music is under the direction of Eric Holtan, one of Tucson’s premier professional musicians, noted for his excellence in innovative ensemble performance.